Attachment rhizoids arising from a ball-like structure. Collected by David John from North Ugic Water, Aberdeen, Scotland.. 28 Aug 2009. © C.F.Carter (chris.carter@6cvw.freeuk.com). This is the type species (lectotype) of the genus Aegagropila. Cladophora balls, or 'Marimo' as the Japanese call them, were declared a Japanese Natural Treasure in 1921, and then in 1952 became a Special Japanese Natural Treasure. Lake Akan is the most commonly known lake containing the balls, but they can also be found in Lakes Shiranitoro, Toro, Kawaguchi and Sai, all in the Iloklaido district of Japan. Local mythology surrounding these balls tells the story of a young man and young woman who are said to have drowned in the lake, and their hearts turned into Cladophora balls. The survival of the balls in Japan has been under threat on more than one occasion. The use of Lake Akan to transport timber caused many populations to die. As the timber floated in the lake whilst waiting to be transported, it blocked the vital sunlight that the plants require. Between 1945 and 1954, water-powered electrical generators caused a drop in the lake's water level, leaving many plants exposed to the open air, and nearly eradicating the population. Cladophora balls were first discovered in Lake Zeller, Austria in 1824 by Dr Anton E Sauter, a physician and botanist. They were named Cladophora aegagropila and they belong to the Cladophora sauteri group. Cladophora means 'branched plant', aegagropila means 'lake ball' and sauteri is derived from Dr Sauter's name. Lake balls were subsequently found to exist in the United Kingdom, Russia, Iceland, Sweden and some other countries. Lake balls have a green velvet-like appearance and have been known to grow to about 30 cm in diameter. At one time it was thought that Cladophora was extremely slow growing, taking between 150 and 200 years to reach the size of a tennis ball. Recent studies however suggest that the slow growth rate in more recent time is due to poor water conditions, It has also been found that the growth rate can be improved by mixing sea water with the lake water. In common with most plants, this species obtains nourishment by absorbing sunlight using the process of photosynthesis. The plants must remain in positions that receive plenty of sunlight otherwise they wilt start to die. Fortunately the plants are able to move around by means of the undercurrents of the lake, which allows them to swap places with plants in the deeper areas of the lake. This process of rotation allows all the plants to photosynthesize and therefore ensures their survival. It has been reported that the plant has the ability to float or sink, in order to position itself depending on the brightness of the sunlight. Plants then to grow in large groups in the shallower parts of the lake, but they can grow so densely that other plant life can be totally obscured. Another benefit of being spherical is that when silt and other fine debris collects on the uppermost surface of the plant, gravity causes it to naturally rotate with the weight and the debris will fall off. Japanese: Marimo (Yoshii et al. 2004). Swedish: Getraggsalg (Tolstoy & Österlund 2003). John, D.M. (2011). Phylum Chlorophyta. Order Cladophorales. In: The freshwater algal flora of the British Isles. An identification guide to freshwater and terrestrial algae. Second edition. (John, D.M., Whitton, B.A. & Brook, A.J. Eds), pp. 557-564. Cambridge: Cambridge University Press. Kützing, F.T. (1845). Phycologia germanica, d. i. Deutschlands Algen in bündigen Beschreibungen. Nebst einer Anleitung zum Untersuchen und Bestimmen dieser Gewächse für Anfänger. pp. [i]-x, -340 ['240']. Nordhausen: zu finden bei Wilh. Köhne. Accesses: This record has been accessed by users 8291 times since it was created. Boedeker, C., Eggert, A., Immers, A. & Smets, E. (2010). Global decline of and threats to Aegagropila linnaei, with special reference to the lake ball habit. BioScience Biotechnology and Biochemistry 60: 187-198. Boedeker, C., Eggert, A., Immers, A. & Wakana, I. (2010). Biogeography of Aegagropila linnaei (Cladophorophyceae, Chlorophyta): a widespread freshwater alga with low effective dispersal potential shows a glacial imprint in its distribution. Journal of Biogeography 37: 1491-1503. Soejima, A., Yamazaki, N., Nishino, T. & Wakana, I. (2009). Genetic variation and structure of the endangered freshwater benthic alga Marimo, Aegagropila linnaei (Ulvophyceae) in Japanese lakes. Aquatic Ecology 43(2): 359-370. Togashi, T., Sasaki, H. & Yoshimura, J. (2014). 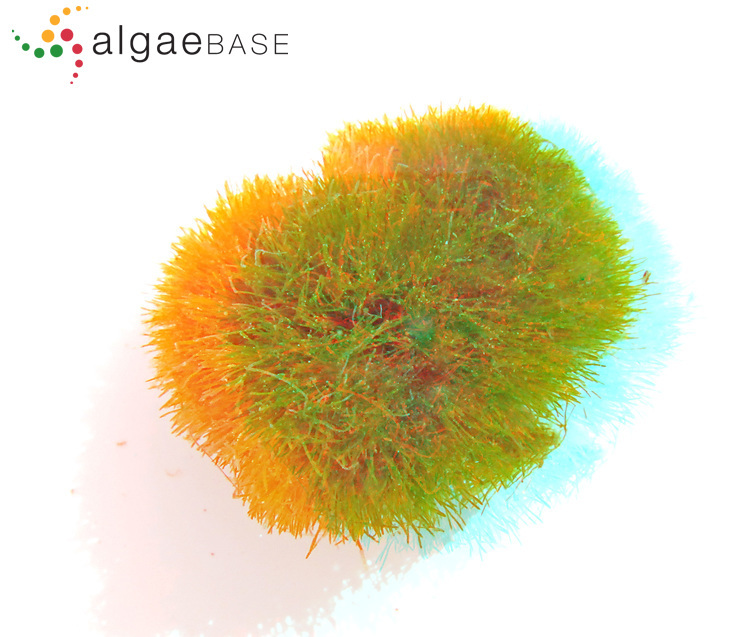 A geometrical approach explains Lake Ball (Marimo) formations in the green alga, Aegagropila linnaei. Scientific Reports 03761: 1-5, 4 figs.